The Best Beginners Crochet blogs from thousands of top Beginners Crochet blogs in our index using search and social metrics. Data will be refreshed once a week. Beginners Crochet newsletter is a comprehensive summary of the day's most important blog posts and news articles from the best Beginners Crochet websites on the web, and delivered to your email inbox each morning. To subscribe, simply provide us with your email address. Colorado About Blog As a newbie yarn lover, coming up with simple patterns is my passion. I live in Colorado with my lovely family, and enjoy making knit and crochet goodies for just about anyone that I know. It's fun for me to share those creations and patterns with those who may enjoy them or want to make them for themselves! Facebook fans 26,559. Twitter followers 818. About Blog I really am very positive person!. I sold a lot of baby booties and they soon became a huge hit so I sat on my computer and started writing patterns.I do LOVE crocheting and I really hope you will enjoy my patterns. I try to explain everything because I was also a beginner once. Facebook fans 105,496. Twitter followers n/a. New Zealand About Blog A free tutorial site that teaches beginner how to crochet amigurumi dolls. Includes easy crochet hat pattern ,flower,applique and more. Facebook fans 22,909. Twitter followers 36. About Blog Get inspired to create. Free crochet patterns, helpful video tutorials, and modern crochet gadgets to help you master the art of crochet. Bedfordshire, UK About Blog A crochet blog for beginners, improves and the more advanced crafters. Learn new crochet stitches, tutorials on crochet techniques, tips and tricks. Facebook fans 17,199. Twitter followers 576. Los Angeles, CA About Blog Hi! I'm Melanie, and welcome to my little bloggy! Grab some coffee and browse around for some inspiration! Facebook fans 43,458. Twitter followers 2,504. Maine, USA About Blog I blog about crochet and other hobbies with the goal of helping other beginner/intermediate crocheters navigate through and learn about this amazing hobby! Facebook fans 383. Twitter followers 200. Storrington About Blog A blog about all things crochet, yarn and even some knitting. You can find lots of my free patterns, tutorials and links to my shop. Facebook fans 4,016. Twitter followers 878. About Blog Easy learning tips for the beginners with a pictorial description of the unique patterns used Along with the video graph description. Facebook fans 545. Twitter followers n/a. About Blog Hey! My name is Sarah, but on here I go by CraftingQueen. I have a passion for crafting. Drawing, painting, crocheting- you name it, I love it! Hope you enjoy my post. Lancaster, PA, USA About Blog A place for all things Crochet - beginner, intermediate, advanced and what-the-hell-is-crochet? levels all catered for. Facebook fans 531. Twitter followers 6. United Kingdom About Blog Free crochet patterns and video tutorials. Original crochet designs. Learn how to crochet with renowned crochet designer Laura Eccleston. Facebook fans 69,721. Twitter followers n/a. About Blog Sharing my own crochet adventures, and hoping others will join me! Especially hoping to inspire absolute beginners who would love to learn but were certain it just looked too difficult. Facebook fans 2,959. Twitter followers n/a. About Blog Hello and welcome to my little blog about all things pretty, vintage and an awful lot of Crochet! I hope you enjoy reading about my vintage and crafty (mis)adventures as much as I enjoy taking part in them. 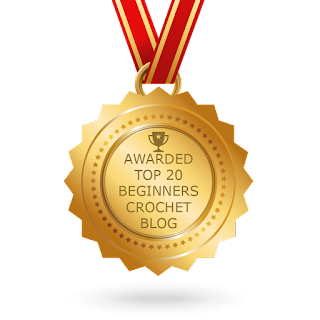 CONGRATULATIONS to every blogger that has made this Top Beginners Crochet Blogs list! This is the most comprehensive list of best Beginners Crochet Blogs on the internet and I’m honoured to have you as part of this! I personally give you a high-five and want to thank you for your contribution to this world.